Browsing articles tagged with " Cumberland"
According to the World Health Organization, 1 in 4 people in the world will be affected by mental illness or some sort of neurological disorder at some point in their lives. This places mental disorders among the leading causes of ill health and disability worldwide affecting more than 450 million people. However, mental illness is still the highest untreated disease. The National Institute of Mental Health estimates that 40-50% of individuals with bipolar or schizophrenia go untreated each year, and the number of those suffering from anxiety and depression is greater. Many ask why so many individuals will not seek treatment, and the simple answer is because of Stigma. Stigma is a mark of disgrace associated with a particular circumstance, quality, or person. Those struggling with mental health illnesses feel fear of disclosing their condition to a complete stranger thinking they may be judged or mistreated. They feel shame or embarrassment that they can’t handle their problems on their own. And others don’t believe they need any help at all. 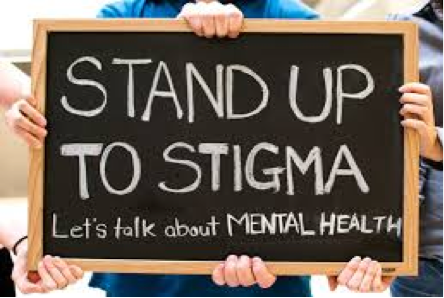 The populations most affected by stigma include young people such as teens and adolescents, men, minorities, military personnel, and those who work in the medical/health field. These people are found to be in the most need of mental health services but most likely will not pursue them. Many “A” list celebrities such as Lady Gaga, Catherine Zeta Jones, Mel Gibson, Robin Williams, Demi Lovato, and Chris Brown have all been diagnosed with Mental Health conditions and have openly discussed such topics with the public. Lady Gaga goes as far as singing about being “Born this way” as she suffers from depression. We recently just laid Robin Williams to rest after his battle with depression. It is not uncommon for many of us to be experiencing symptoms of a mental health issue. However, it is common that many of us will not get help due to stigmatized reasons. No illness should go untreated because of stigma. Here at Anchor Counseling Center, our mission is to provide superior, family-oriented, mental health services through dependability, integrity, and social responsibility across Southern New England through education to understand that mental illness should be regarded the way physical illness is – as something to be diagnosed and treated without judgment or stigma of any kind. We at Anchor Counseling Center want to help you, no Stigma attached. If you or a loved one is in need of mental health treatment, please call our office at 401-475-9979 to schedule an appointment. As the divorce rates continue to trend upwards in America, many parents are finding themselves with a new challenge to face. At Anchor Counseling we recognize this trend. Once a marriage has officially dissolved, many people would like to close the proverbial door on that chapter of their lives. However, when children are involved, the ex-spouses are forever linked in that very special way. Through my work with counseling co-parents, I have discovered some common road blocks many couples stumble over preventing them from successful co-parenting their children. One of the hardest aspects most co-parents will face is trying to move past the residual emotions left behind from the dissolved relationship. The separation process tends to leave a trail of resentment, pain, and mistrust for different reasons; yet, in order for successful co-parenting to occur, these emotions have be left out of the process. This is certainly easier said than done, which is why parents are encouraged to find their own appropriate outlet for these emotions (talking to a family member or friend, exercise, yoga, relaxation techniques, reading, and any other healthy stress-relieving activity). Although using the phone to vent to a trusted support can be helpful, make sure you are aware of your surroundings. Children are often extremely curious about the details regarding these situations, and they can be quite adept at eavesdropping on phone conversations. Make sure to double-check for “little ears” and find a remote location before expressing your frustrations regarding your ex-partner. When you are speaking to your child (or if he/she is in earshot), please refrain from saying anything negative regarding the other parent. I typically encourage co-parents to keep it either positive or neutral when discussing the other parent with the child, and if this is too difficult, I revert back to the old saying, “If you have nothing nice to say, don’t say anything at all”. Children can be quite impressionable, and negative comments about the other parent can be full of impact and confusing. Most children have a difficult time dealing with a fundamental shift in their family’s dynamics, and any added confusion is not helpful. As best as you possibly can, you want to encourage the child to have a positive relationship with the other parent. Although the other parent may have been a poor spouse, he/she might have some positive aspects to their parenting from which your child could benefit. As children grow, they will discover which parent(s) are there for them, which parent(s) they can trust, and which parent(s) truly love them. If you do your part, they will come to respect you for it when they get older. If the other parent does not do their part, the child will recognize this as they mature – you don’t need to point it out to them every step along the way. Often times throughout co-parenting, the child will need to transition from one parent’s care to the other’s care. These transition times can be impressionable for the child, and they provide another opportunity to successfully co-parent. In order for these interactions to be positive, both parents need to demonstrate a level of respect for the other person. For the sake of the child, each parent should interact in a positive and cooperative way during these transitions. A child can be quite in tune to a parent’s affect and body language, so each parent should be aware of how he/she is presenting during these transition times. Each parent needs to demonstrate respect in what they say, as well as how they act. If one parent is going to be late for the transition meeting, he/she should alert the other party to inform them of this development, therefore demonstrating respect for the other parent’s time and schedule. Role modeling a healthy and respectful relationship with the other parent can be tremendously influential to the child’s development and happiness. Co-parenting with an ex-partner can seem overwhelming, unbearable, and downright impossible at times. However, when co-parenting is done correctly (through respect, healthy communication, and positive transitions), this process can become a little easier. If you find yourself in this situation, please remember to keep the best interest of this child first and foremost. When this perspective is taken, the co-parenting process can be successful. Remember, you can only control yourself. If you focus your efforts on becoming the best co-parent that you can be, hopefully the other parent will follow suit. We at Anchor Counseling want to help you. Please visit our website by clicking here. If you would like any additional information on my own professional ideas or modalities of treatment please click here. You can follow us on Facebook by clicking here. You can follow us on Twitter by clicking here. Each week couples come into our office seeking help for problems in their relationship. Some couples have been married for several years and feel that they have lost a connection with their spouse. Others have only been together a couple of years but feel that they are no longer happy together. Whichever category you fall into, it is important to seek some kind of counseling as soon as you start to feel unhappy. According to John Gottman, a relationship expert, the average couple waits six years before seeking therapy for problems in their relationship. Trust: According to Gottman, trust is the most vital ingredient to a successful relationship. Many factors go into building trust and it is something that couples need to nurture every day. Good communication: It is important to listen to what your spouse has to say and consider their feelings when making decisions. One way to make sure everyone feels that their opinion is heard it to take turns talking and not allow interruptions until the other person is done speaking. Make time for each other: Often couples report that they are not spending time together like they used to. This can be due to busy schedules or having children. Some couples feel that finances hold them back from doing things together. All couples, no matter what their situation, can take half an hour each day to go for a walk or cook together. Parenting: Being on the same page in terms of parenting is crucial. Not agreeing on rules and consequences at home can lead to children acting out which can make for an unhappy household. Do we need Stress in our lives? 6 Steps to decrease. Do you really need stress in our lives? I know many of you may be thinking “Well of course not, who needs stress?” but believe it or not we do need some level of stress in our lives in order to function. There is such a concept as good stress (eustress) as well as bad stress (distress). I think most of us are more familiar with distress but eustress actually helps us thrive in our daily lives. Eustress (good stress) can be events such as starting a new job, getting married, having a baby, etc. To most of us, we may think these are great moments in our lives and of course while they are great moments, it also involves some level of stress. So now let’s switch over to distress. It’s something everyone has encountered and coped with differently. If we are able to see challenges in our lives as manageable, it will lead us to handling stressful situations effectively. I would like to offer some self-care techniques that can help us cope with stress more effectively. These are strategies that when implemented on a consistent basis will help improve our mood, overall well-being, and perspective in general. Please check out the bulleted list below to learn more about these strategies and see if you are already applying them in your daily lives. v Take time to relax. Seriously this is important. Try to take mini breaks throughout your day. Examples include going outside for a brief walk, stretching, taking deep breaths. v Get enough sleep. We underestimate how much sleep we really need in order to function. A healthy range for adults is anywhere between 6-8 hours every night. If you can get more then you’re in good shape. v Practice positive self-talk. This will help us to view stressors as manageable rather than impossible. Examples include: “I will get through this”, “Things will get better”, etc. v Exercise. Believe it or not adding physical activity to your day will help release energy in a positive way and provide you with a more balanced outlook on life especially stress. v Make a to-do-list. Getting organized by making a checklist at the beginning of your day of reasonable items you can accomplish will alleviate stress. v Enlist social/family support. Talk to friends and/or family members on a regular basis. It is vitally important that we connect with others and share our feelings. It is okay to ask for help. Can you think of a time in which you were faced with what you thought was an impossible thing to overcome? Think about how you handled and could you have handled it differently. If so, would it have made a difference on how you felt following the outcome of that event in your life? The Military presents challenges for all! At Anchor Counseling we provide therapy to families from deployed individuals. As a military wife/SO for over 10 yrs I have been a part of many different experiences. Military life is a unique cultural that at times can present challenges to individuals and families as well as lots of successes. As the war comes to an end, there will be many soldiers returning home that may be dealing with many different changes and expectations. As a clinician, I think it is extremely important to become educated with this population and be aware of different issues/needs and concerns that they may face on a daily basis. Reintegration is a joyous and stressful time! Reintegration is about more than coming home. It is about resuming and establishing relationships that provide pleasure, comfort and support. Many service members returning from deployment may experience what are referred to as “invisible injuries”. Invisible injuries include posttraumatic stress disorder (PTSD), traumatic brain injury (TBI), depression and anxiety that can result from combat exposure. Sometimes alcohol, tobacco and drug use, as well as impulsive or aggressive behavior can magnify these conditions. All of these problems can compromise relationships reducing one’s ability to enjoy pleasurable and health activities. Here are a few helpful tips for what soldiers/spouses and children may feel/experience. With deployment comes change. Knowing what to expect and how to deal with changes can make homecoming more enjoyable and less stressful. Below are some hints you might find helpful. You may miss the excitement of the deployment for a while. Some things may have changed while you were gone. Face to face communication may be hard at first. Sexual closeness may also be awkward at first. Children have grown and may be different in many ways. Roles may have changed to manage basic household chores. Spouses may have become more independent and learned new coping skills. Spouses may have new friends and support systems. You may have changed in your outlook and priorities in life. You may want to talk about what you saw and did. Others may seem not to want to listen. Or you may not want to talk about it when others keep asking. Soldiers, used to the open spaces of the field, may feel closed in. Soldiers also may be overwhelmed by noise and confusion of home life. Soldiers may be on a different schedule of sleeping and eating (jet lag). Soldiers may wonder if they still fit into the family. Soldiers may want to take back all the responsibilities they had before they left. Soldiers may feel hurt when young children are slow to hug them. Babies less than 1 year old may not know you and may cry when held. Toddlers (1-3 years) may hide from you and be slow to come to you. Preschoolers (3-5 years) may feel guilty over the separation and be scared. School age (6-12 years) may want a lot of your time and attention. Teenagers (13-18 years) may be moody and may appear not to care. Any age may feel guilty about not living up to your standards. Some may fear your return (“Wait until mommy/daddy gets home!”). Some may feel torn by loyalties to the spouse who remained. Anchor Counseling Center is sharing the latest on Suicide Prevention. As a private practice with locations in East Providence, Cranston, Lincoln, and North Attleboro, we are very involved in the community and reach out to our members with a caring and supportive manner. Our mission is to provide our patients with the help they want as quickly as possible with reliable, courteous, and professional counseling and psychiatric interventions. 1. Notice if the person appears quiet and withdrawn, oversleeps, has crying episodes, has loss of appetite and energy, appears dishevelled, the gaze is downward, the voice tone is flat, consistently negative comments, irritability, or says things like, “Life’s not worth living,” or “I hate my life,” etc. 4. If the person indicates yes, go to the next step. If the person says, “I don’t know,” hear this as a “yes” to the question in #3. 5. Ask: “Have you thought about how you might end your life?” If the person says yes, the risk is increased. 6. Ask: “What have you thought about as how you might do it?” If the plan or method is ineffective or non-lethal, such as cutting wrists, the risk is low. If the method is lethal such as using a gun or jumping from a bridge, etc., the risk is high. 8. If the person says “no” or “I don’t know,” to the question in #7, say: “What I am hearing is that you are in a lot of pain right now and thinking of ending your life, so I am wanting you to go to the emergency room right now and get some help to feel better right away. Will you go? I will make sure you get there safely. Is there a family member or someone I can call to go with you?” Or tell the person you will go with them yourself. 9. Arrange for the suicidal person to be accompanied to the emergency room, and call ahead to tell emergency staff the person is coming. 10. If the person refuses, then ask the person to wait there with someone while you call police in another room to report that the person has threatened suicide with a lethal method. Ask the police to come and accompany the person to the emergency room. If you know someone that needs help please call us immediately at 401.475.9979. *Note: If the person rates his mood as 6 or over, after feeling consistently depressed, and he now reports life is great and he is smiling, the risk may be increased because he has decided to end his life and has made arrangements. “ Days when she undergoes aggressive chemotherapy treatments are her most difficult, yet she continues to be a strong woman dedicated to her family and friends, and still fighting her cancer with all the strength she can muster,” friend Beth Small said. A small group of us decided to put together a benefit for Cammie and her family. Please click here to continue reading. You can also click here to make a contribution. The event is being held Sunday, June 3rd at 1pm in Cumberland RI. You can also see the event on Facebook. Being alone while still connected! Technology Today! We loved this article so much we decided to put it on our own blog. This article is filled with very insightful information regarding today’s world on how difficult it can appear to be alone. At our desk, on the road, or on a remote beach, the world is a tap away. It’s so cool. And yet it’s not. What we lose with our constant connectedness. Technology also makes life infinitely more manageable. It’s what allows me to begin writing this essay from a packed coffee shop on a snowy winter afternoon while still being connected with my editors and finish writing it from my kitchen in the middle of the night, when all the interruptions of the day have faded away (unless I want to check Facebook to see how many of my friends are also nuts enough to be staring at a computer screen at 3 a.m.). And technology simply makes things more fun, like the way my wife will hold her iPhone up to a restaurant ceiling speaker and instantly be told that the vaguely familiar tune of funky ’70s cheese she hears is “Sky High,” by the one-hit-wonder band Jigsaw, rather than letting that little mystery make her cerebrum ache for the rest of the day. So please don’t confuse what I have to say for that tired Luddite screed about how technology is ruining us. It isn’t. Because of technology, we never have to be alone anymore. And that’s the problem. I’M SITTING IN A PEW near the back of St. Anne’s Church in Fall River, a soaring structure of Vermont blue marble that could rival a lesser European cathedral. It was built in the late 1800s, when the southeastern Massachusetts mill city’s French Canadian community was big enough to warrant a church able to seat 2,000. On this blustery afternoon, the crowd is more like a tenth of that. The priest is talking, but the lousy PA system makes it hard to hear what he’s saying. So I’m doing what I’ve done before in this situation: trying to keep my young daughters occupied by whispering for them to study their surroundings — the exquisitely carved red-oak woodwork near the high ceiling, the enormous pipe organ in the rear balcony, the colorful stained-glass windows on every wall. With its combination of architectural grandeur and crumbling-plaster fatigue, the place is like Venice in the unforgiving light of morning, rather than the soft-lit romanticism of night. It’s honest and beautiful. Then I hear an odd chirping. My eyes follow my ears to a pew to my left and behind me, where a guy with slicked black hair and dark glasses is sitting. He’s chewing gum and wearing one of those Bluetooth cellphone attachments in his ear. Hey, man, I’m bored, too. But, c’mon, take that infernal thing out of your ear. Say a prayer. Collect your thoughts. Or just do what my 4-year-old is doing and stare at the ceiling. Did I mention it was Christmas Day Mass? I looked up from my laptop, incredulous that a mother could be so blase about violating her daughter’s privacy, not to mention library decorum — and convinced that the therapist and the daughter must have no time to discuss anything besides mother issues. Now, I know what you’re going to say. There have always been boors blabbing in places where they should be quiet, blithely ignoring the shushes from librarians or the stares from fellow elevator passengers while behaving as though they’re the only ones whose problems matter. Bad manners are bad manners, irrespective of technology, right? Yes, only technology has vastly expanded this bad behavior, eroding much of society’s stigma against it, and making it everybody’s problem. But here’s the real point: It is dulling our very capacity to ever be alone, or alone in our thoughts. The late British pediatrician and psychoanalyst Donald Winnicott popularized the phrase “the capacity to be alone” in the 1950s, to describe a pivotal stage of emotional development. Winnicott argued that an adult’s capacity to be alone had its roots in his experience as a baby, learning to function independently while still in the presence of his mother. Yet today we’re seeing this capacity weakened, whether we’re in public places known for contemplation, like churches and libraries, or whether we’re just sitting by ourselves at home, losing the fight to resist answering our BlackBerries (just ask our new president) or checking our laptops for Facebook updates. What’s fueling this? Conley says it’s anxiety borne out of a deep-seated fear that we’re being left out of something, somewhere, and that we may lose out on advancement in our work, social, or family lives if we truly check out. “The anxiety of being alone drives this behavior to constantly respond and Twitter and text, but the very act of doing it creates the anxiety.” This is particularly true among young people, mainly because they don’t know life when it wasn’t like this. I HAD A GREAT TIME in college and was fortunate to make lots of close, lasting friendships. But if I want to be honest with myself, I can remember plenty of times when I felt uncomfortable. And many of the earlier ones involved eating alone in the dining hall. I didn’t eat by myself often, and when I did, it was usually a simple matter of conflicting schedules with my friends. But my unease sprang from my inability to convey that to the strangers around me. Honest, I’m not a loner. I had to learn to deal with the discomfort. Sometimes, it would force me to strike up conversations with strangers or be receptive when they engaged me. Other times, I would just sit alone and read or think. The discomfort never went away entirely, but it sure receded with practice. If I were in college nowadays, I doubt that would happen. I would be filling my alone time texting any friend I could think of. Whenever I’m on a college campus these days, almost all the students I see sitting by themselves are furiously thumbing their iPhones or BlackBerries. For all I know, they could simply be playing Sudoku. Yet the message they’re sending is unmistakable. I am not alone. Sure, texting a friend can make you feel less awkward. But, in the long run, so can learning to step outside of your shell, or becoming at peace within it. This change in campus life isn’t restricted to dining halls. The quads are teeming with ear-budded students texting and talking on cellphones rather than sitting with an open book or talking to the person next to them. In important ways, they’re not fully there. To see how these technological patterns are changing the college experience, University of Toronto researcher Rhonda McEwen tracked the communication behavior of students across their freshmen year. She found them delaying the full plunge of forming new friend networks and breaking away from their old ones. In their first semester, the freshmen generally hold on tightly to their high school friends, talking with and texting them frequently and keeping up with them on Facebook. As the year moves on, they generally shift their high school friends to Facebook and instant messaging while focusing more of their texting and phone calls on their new college pals. In the summer, they shift back, with high school friends returning to the top of the communication hierarchy. There are things to be happy about in these patterns. The lifeline of old friends can help staunch the feelings of loneliness that are as common to the freshman experience as rapid weight gain. But those old contacts can also turn into a crutch that prevents students from truly engaging with the new world around them or learning to be alone in their own mind. One of the freshmen McEwen interviewed confessed that every day she spent her lunchtime sitting on the steps outside a campus building, calling or texting her sister. That was less painful for her than sitting alone. Yet like the helicopter parents who hover over their children at the playground in the hopes of shielding them from bumps and bruises, we can delay the hurt only so long. As the Talmud tells us, sometimes a little bit of pain can be a blessing. It’s hard to imagine a Henry David Thoreau emerging from this millennial generation, someone motivated to log two years and two months alone in the woods around Walden and wax about how he “never found the companion that was so companionable as solitude.” He’d have no time to observe the bullfrogs or water his bean plants. He’d be too busy searching for a Wi-Fi signal. Anthony Storr made a persuasive case for the value of deep, uninterrupted alone time. He found it in ample supply in the lives of not just philosophers and physicists, but also some of the greatest poets, novelists, painters, and composers. It’s important to distinguish between being alone and being lonely. In the new book Loneliness, University of Chicago psychologist John Cacioppo and his Massachusetts coauthor William Patrick argue the pangs of loneliness that we sometimes experience are the evolutionary equivalent of the shooting pain we feel after touching a hot stove. These pangs are ingrained reminders of how bad social disconnection is for our well-being. Cacioppo uses everything from brain imaging to blood-pressure analysis to demonstrate the serious drag on our health that loneliness can have. At first pass, this line of thought would seem to contradict the argument Storr made in Solitude and pretty much everything I’ve written to this point. Yet that’s not the case at all. It turns out that research shows people who feel lonely are no more likely to be physically alone. Cacioppo acknowledges that solitude can be very healthy, and he compares loneliness to a sort of thermostat, a state of mind that kicks in at different points for different people. While we humans need social interaction, he’s in agreement that we won’t find it through Twittering and texting. Cacioppo points to research showing that electronic communication can increase social isolation and depression “when it replaces more tangible forms of human contact.” Another team of psychologists termed this form of communication “social snacking.” But, as he writes, a snack is not a meal. So why do we feel so compelled to swap messages with people who aren’t next to us and rack up hundreds of friends to keep electronic tabs on? that is like Facebook except stripped of all mildly interesting content and about as much fun as a Chamber of Commerce networking night. Here’s the irony: The explosion of all this electronic networking and friending may ultimately rob weak ties of most of their strength. If we’re all linked up with hundreds if not thousands of people, there is no longer much value to the information they possess. It’s no longer exclusive. A stock tip whispered in your ear by someone in the know can make you a mint (if it doesn’t land you in jail). But what good is a stock tip broadcast on CNBC? Sure, she’s a decade older than that girl crying from the pay phone in Madrid. But the real difference is that, although she’s living abroad now, she hasn’t really had to leave her family. Every night at 9 o’clock, she logs on to the Internet video chat service Skype and catches up with her mother, usually for two or three hours at a stretch. “I don’t feel the distance as much,” she says. What’s wrong with this? On one level, nothing at all. Quiroga is sociable, happy, and well adjusted. She’s managed to form close friendships with other students in her program while still keeping strong ties with her family. Neil Swidey is a staff writer for the Globe Magazine. E-mail him at swidey@globe.com © Copyright 2009 Globe Newspaper Company. We treat Pain Killer Addiction in RI with Suboxone! Addiction to prescription painkillers is reduced when the individual is given consistent treatment with the drug Suboxone (buprenorphine plus naloxone), according to the first randomized large-scale clinical trial focused on the use of medication for treating prescription opioid abuse. Pain medications are helpful when taken as prescribed; however, they have high abuse liability, especially when taken for nonmedical reasons. Researchers in this study set out to examine whether the FDA-approved medication Suboxone could help fight this growing problem. Interestingly, researchers also found that there was no extra benefit when intensive opioid dependence counseling was added to the drug treatment. Suboxone is a combination of buprenorphine to reduce opioid craving plus naloxone, which causes withdrawal symptoms in a person addicted to opioids if Suboxone were taken by a route other than orally, as prescribed. This combination was developed specifically to prevent abuse and diversion of buprenorphine and was one of the first to be eligible for prescription under the Drug Addiction Treatment Act, which allows specially trained doctors to prescribe certain FDA-approved medications for the treatment of opioid addiction. Most research focused on treating opioid dependence has been conducted with heroin-addicted patients at methadone clinics. As a result, there has been limited information on how to treat those addicted to prescription painkillers, especially in the offices of primary care doctors. To help remedy this issue, the National Institute on Drug Abuse started the Prescription Opioid Addiction Treatment Study (POATS) in 2007, which was carried out at 10 treatment sites around the country. “Despite the tremendous increase in the prevalence of addiction to prescription painkillers, little research has focused on this patient population,” said Roger Weiss, M.D., of Harvard Medical School, Boston, and the lead author of the study. In the study, over 600 treatment-seeking outpatients addicted to prescription opioids received Suboxone along with brief standard medical management, in which doctors evaluated treatment effectiveness and suggested abstinence and self-help methods. Half of the subjects also received varying degrees of counseling provided by trained substance abuse or mental health professionals. Results showed that approximately 49 percent of participants experienced a reduction in prescription painkiller abuse during the extended (at least 12-week) Suboxone treatment. However, when Suboxone was discontinued, this success rate dropped to 8.6 percent. Reductions in abuse were observed regardless of whether the patient reported suffering chronic pain, and participants who participated in intensive addiction counseling did not have higher success rates when compared to those who did not receive counseling. According to an annual national government survey, an estimated 1.9 million people in the United States meet abuse or dependence criteria for prescription pain relievers. In addition, the Centers for Disease Control and Prevention report that annually, more people die from prescription painkiller overdoses than from heroin and cocaine combined. The research is published in the Archives of General Psychiatry. If you or someone you know need help contact us now! Or find additional information on our website! What is DBT? How does it work? Can it help me? Copyright © 2019 Anchor Counseling Center, Inc. All Rights Reserved.